This is a simple sweet prepared with Moroccan couscous. It is not authentic but is very delicious and can be made in a jiffy. It is a quick and easy way to satisfy your sweet cravings. Today we will learn how to make an easy dessert (Indian style) with couscous following this easy recipe. Bring 1 cup of water to boil, pour it over the couscous, stir and keep it covered. Let it sit for 10-15 minutes. Once all the water is absorbed, fluff it with a fork and keep it aside. Refer how to cook couscous for more details. 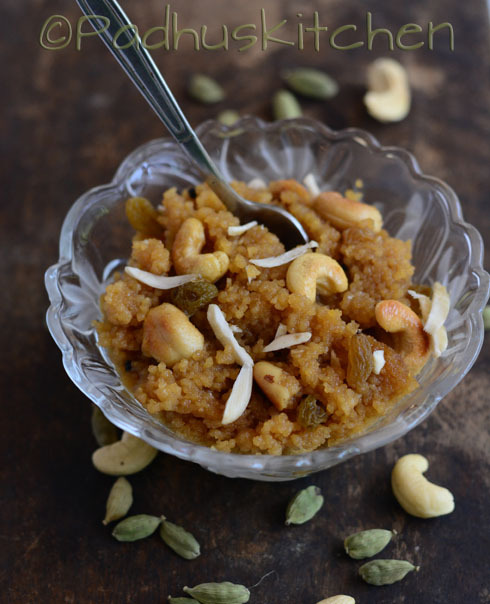 In a pan, add jaggery, just enough water (3-4 tbsp) to cover the jaggery and heat it. Dissolve the jaggery in water. Switch off the heat and filter it to remove impurities if any. Use a stainless steel mesh. Bring jaggery water to boil with a tsp of ghee and cardamom powder. When it start bubbling and thickens slightly, add the couscous it it and mix well. Cook on low heat for 2-3 minutes so that the couscous get incorporated well with the jaggery syrup. Heat a tsp of ghee and fry raisins till it slightly puffs up. Remove the raisins and in the same pan fry the cashew nuts until golden brown. Then add both to the jaggery + couscous mixture. Garnish with slivered almonds and serve warm.